Polka Dot Overload | Sewing, knitting & vintage projects, tips, tutorials and cartoons! : $1 a yard, pt. 2: Things I have made with cheap fabric! $1 a yard, pt. 2: Things I have made with cheap fabric! Polyester polka dot overload, circa 2005. Another cheap fabric PRO: Bragging rights. "Oh this? I got it at the thrift store for $2." Except maybe "Oh this? I made it." Or better yet: "Oh this? I made it with some $2 fabric from the thrift store." 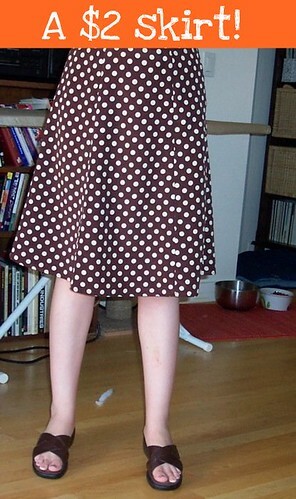 A $2/yard polka dot poly skirt (Simplicity 5914), from Fulton Fabrics in Brooklyn. Made it in 2005, still wear often. Super fast, super fun (photo at top of post). I was not struck down by any sewing deities as a result. They weren't the nicest things I've ever made... but they weren't the un-nicest, either. And I think full-ish skirts are generally a better bet with cheap un-breathable fabrics since they don't cling to your skin as much as tops. 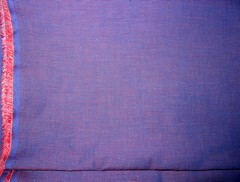 $2/yard iridescent purple poly/cotton shirting from "It's a Material World" (257 W. 39th St.). 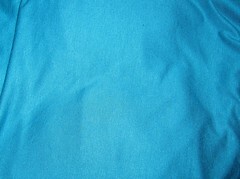 $3/yard super-soft lightweight turquoise cotton/lycra blend from Modeani (was across the street from "It's a Material World", but gone now, I think). So, remember how I said the discount Denver Fabrics wool-blend navy jersey in my color-blocked Sew Grateful Skirt was tissue-thin? 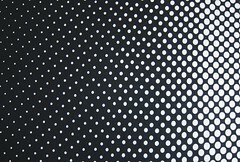 Yeah, well, the second time I wore my skirt--even with a slip--the thinnest spots began turning into runs, like the kind you get in cheap nylon stockings. This makes me incredibly sad, but I'm not sure whether darning is even worth it, the fabric is so thin in places. I don't know how I could really reinforce it without taking the whole thing apart, either. SUCH a bummer, because I love the look of it! 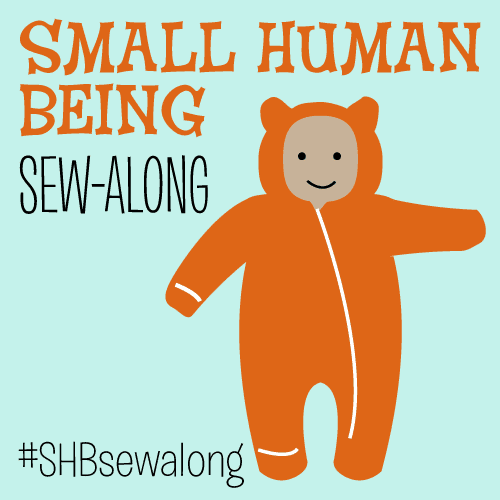 So, let's hear your bragging--what's the cheapest thing you've made--and still gotten compliments on? Modeani lives and in the same location, only it's now called "Nahir." Same grumpy owner, same bad service. But fun! 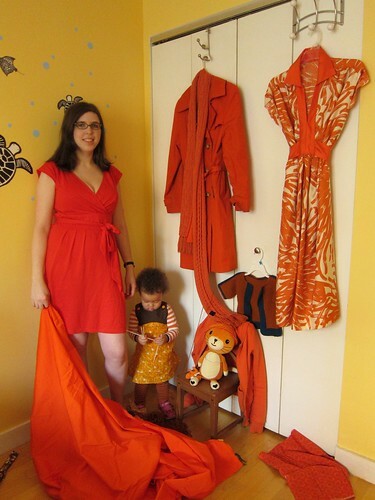 I paid $2 for a cotton duvet cover I turned into my favorite dress ever: http://3hourspast.com/2011/02/27/finished-object-the-wholesome-dress/ I wore it for a long time, too, before she succumbed to summer-sweat-stink. Sigh. I've been known to buy garments from the thrift store that are way too big for me - because I saw them as fabric potential, regardless what the garment was. That's funny to see you post about Sewfisticated Fabrics -- I live about a mile away from there and must resist (RESIST!) stopping in when on my way to the grocery store. 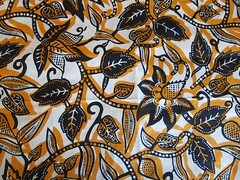 The African prints are worth the trip, as well as checking out all the blingy quinceanera tiaras. I'm not sure this counts but I made a pair of jeans out of old jeans crazy quilt style and those were beauties! You're right. There's nothing better than saying you made something fabulous for 2 bucks. 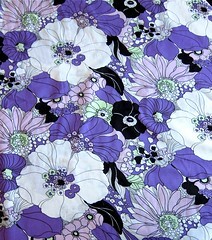 I think the most cost effective thing I've sewn is the floral Jalie 2921 shirt. I think that rayon jersey was on sale for under 5 bucks a yard, and I used about a yard. Oh, and my floral Pendrell was made with a synthetic woven that was 3 bucks a yard, I think. I'm sorry for your skirt ! ALL my handmade clothes (for the most part) were made inexpensively, because I'm cheap cheap cheap. I repurpose thrifted sheets, tablecloths and curtains all the time. The most expensive fabric I've ever bought was some $12.99/yd. ponteroma knit, but it was 60 inches wide and I only bought one yard and I didn't use a pattern for it so the overall cost of that skirt wasn't bad. I do regret some of the things I've made from cheap broadcloth or gross poly lining, and I've had horror stories with $0.99/yd. fusible interfacing, but until my skills improve greatly I'm not even going to touch anything fancy. For my older son, the little jacket that I made from a thrift store Pottery Barn twill pillow sham. Even lined and with a hood, all total, it cost me $5.25 to make and it's awesome. My little guy was wearing it yesterday and I was reminded how much I love that jacket. I've never done quite that well for myself, but my recent least expensive project that was still wearable is the pair of purple topstitched skinny jeans that I made from $4/yd fabric at Denver Fabrics. I can almost always find quality denim for that price there. Most of my clothes these days are made with fabric I obtained for pennies on the dollar... 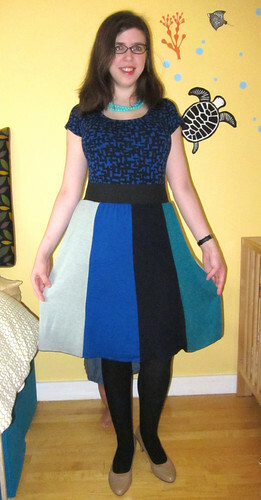 I wouldn't call it "cheap fabric," per se, but more like "awesome fabric that was super cheap to buy." :) I get lots of my stuff at yard sales, thrift stores, and the flea market, so it's not out of the question to get some kind of wonderful silk or rayon for a couple of dollars. 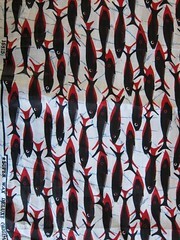 I'm lucky to have the $2.97/yd table at G Street Fabrics. I've had some awesome finds. Because my sewing stash is out of control, I no longer have the cheap fabric debate. But I certainly do have the cheap yarn debate!